It has been a busy week on the International Space Station! 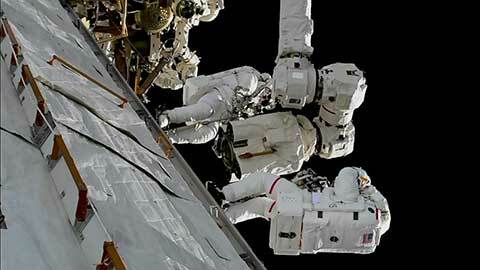 One of the most exciting parts was the first of three space walks that took place. Two more space walks will take place later this month. Like most things that we use or live in, the space station has occasional repairs and modifications done to make it more successful. Performed by three astronauts last week, these necessary upgrades were made to the space station! A walk in space is nothing like a walk in the park; it requires careful planning well ahead of when the walk takes place. When people go on walks on Earth, they can just go outside and enjoy the fresh weather, the beautiful light streaming through the leaves, and the birds chirping in greeting. Space, however, is a completely different walk, though I imagine it is incredibly beautiful and breathtaking in its own way. The first of the three space walks occurred on Thursday, October 5th, 2017. The goal of this walk was to remove and replace one of the Canadarm 2’s Latching End Effectors (LEE). However, the first step of the walk was not a physical step, but a step in the preparation process. Before the space walk could take place, astronauts Randy Bresnik and Mark Vande Hei confirmed with specialists at Mission Control of what the astronauts would be accomplishing on the first space walk, and ensuring their space suits were good to go. The astronauts’ goal of replacing one of the LEEs was important because of the function the Candarm2 has on the International Space Station. The Candarm2 LEE provided data in the rest of the Mobile Base System built by Canada, and can move from different parts on the space station’s truss to other trusses. The arm also has a grappling function that holds onto cargo vehicles and payloads, keeping them attached to the space station. However, recently the Canadarm 2 grappling mechanism has been stalling. While the stalling has yet to create issues in the normal and planned operations of the space station, the repair work completed on October 5th will ensure that it does not create issues in the future. After 6 hours and 55 minutes, the replacement of the Canadarm 2’s LEE was successful. In addition, Bresnik and Vande Hei accomplished other tasks as well that will help other space walks and missions go smoothly. With the first walk done, and the first set of repairs on the Canadarm2 complete, the rest of the work on the Canadarm2 can take place. Space walks two and three will include continued work on the Canadarm 2 and the replacing of exterior cameras on the outer side of the space station. The next space walk will be conducted on October 18, at 8:05am Est. To watch the space walk live, go to the following link on the above dates. Coverage will start at 6:30 est.